I don’t know where this book has been hiding or why everyone on the planet isn’t talking about it, but it is FABULOUS. I had not one second of boredom and many, many fits of giggling. I was a bit surprised at first at how similar it is to Gail Carriger’s Parasol Protectorate series or Delilah S. Dawson’s Blud series (sassy Victorian spinster for the former and Victorian circus for the latter; P.S. Both are great, if you haven’t read every book by both of those authors get on that), but I think it compliments them nicely rather than copies them. Veronica Speedwell is a bit more advanced in her worldliness (she sleeps with men out of wedlock, but only foreign men) than Alexia is and Stoker is a nice combination of Connell and Crim, all of them loving a lady who is ahead of her time. I really feel that the dialogue and wording is fitting for the time, when listening to the audiobook I felt as though I had time traveled and was eavesdropping on someone’s really exciting life. Oh, speaking of an exciting life, our Veronica is a lepidopterist (a butterfly scientist who goes on expeditions)! HOW FUN! It is a really very cute element to this story. I just can’t gush enough about it. The twists and turns in the story were all very exciting. In the beginning, Veronica’s remaining guardian dies and she is left all alone in the world. She doesn’t know who her parent’s are or where they’re from. A German baron shows up at her cottage and persuades her that she is in danger and that she must come to London with him (she is not stupid, originally she accepted his office to London because she planned on using it as a free ride there so she could get to an expedition, but he convinced her on the ride there that he knew something about her past) and he ends up leaving her with Stoker while he gets a few things sorted out. The baron turns up murdered, and Veronica and Stoker end up on a quest together to find out why he was murdered. It. Is. So. Good. 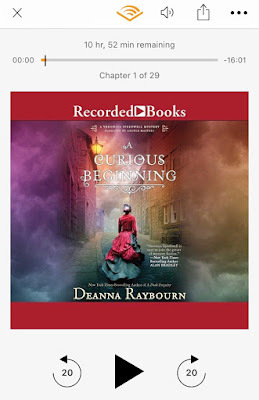 Buy A Curious Beginning (aren’t the covers amazing?) or get the audiobook. Be sure to read it by the end of the year because the second book in the series, A Perilous Undertaking, comes out January 10th, 2017.